Pictured are foundation board members and teacher/winners: back row, Board members Keva Jackson, Joel Pedersen, Joel Jolly (chm. ); second Step, Melinda Zipf, Angela Fallaw, June Wall , Tyra Miller, Brandi Strom, Jackie Kennion, board member Blair Massey, Laurie Prince, Diane Knight, board member Pat Altman; first Step, Dana Kaltz, Lakendra Garrett, Mandi Lowe, Jill Paul, Kathie Britton; front row, Jennifer Rice, Kimberly Gilley , Kimberly Lorimer, Janice Bass, Patricia Bowen, Darla Steele. The Foundation for Public Schools recently held a reception for board members, contributors and teachers who have received Vision Grants through the Foundation. These grants act as incentives to excellent teachers who strive to improve the educational opportunities for the children of the public schools. 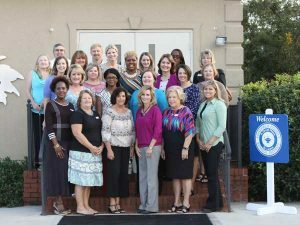 At the reception held recently at Strom Thurmond High School, nineteen grants were given to the teachers chosen from the many who applied.